santa claus Archives | What Should We Do Today? What Should We Do This Weekend? December 8-11, 2016 Holiday Edition! 12 Elves of Dublin Scavenger Hunt in Historic Dublin – pick up a 12 Elves Card at a participating location then find all 12 elves. Each time you find an elf you will get a special treat! Turn your card in to enter the Grand Prize drawing! Wildlights at the Columbus Zoo and Aquarium – see the amazing light shows, special performances and holiday festivities! Tribute to the Nutcracker at Grove City City Hall – see the animated window display Monday through Friday from 4:00 PM – 10:00 PM and Saturday and Sunday from 12:00 PM to 10:00 PM. Ohio Chinese Lantern Festival at Ohio Expo Center and State Fairgrounds – a 5 week celebration of Chinese culture with amazing silk lanterns, traditional performances and food! Uptown Scrooge – an interactive, walking performance through Uptown Westerville! Appropriate for ages 5 and up! State Auto Christmas Corner – walk around inside a life-size telling of the Christmas Story and check out their schedule for each weekend’s choir performances! Merry and Bright – the holiday celebration at Franklin Park Conservatory includes special music, beautiful lights, and a special holiday train! Christmas Celebration in Grove City – check out the list of ongoing events in Grove City’s Town Center! Dickens of a Christmas at Ohio Village – celebrate a Dickens-inspired Christmas at Ohio Village! Downtown Columbus Holiday Lights Photo Contest – share your pictures on Instagram or post to their Facebook page with the hashtag #DowntownColumbus to enter the contest for a $20 gift card to a downtown restaurant! Hockey Santa at The Chiller Ice Rinks – skate with Santa with free skating instruction and cookie decoration! Live Music and Santa at the North Market – check the link for the special holiday activities throughout December! Fantasy of Lights at Alum Creek State Park Campgrounds – take an in-car tour of this light show! For more ongoing ideas like the Huntington Holiday Train, Think Outside the Brick Lego Exhibit, and more, click here for 10 of Our Favorite Columbus Christmas Traditions! 6:00 PM – Elf PJ Party & Lucky’s Market Hot Cocoa Bar at Drexel Theater – the movie will be shown all weekend, but Thursday is the only night for the hot chocolate bar! 11:00 AM – Family Fun Day in Uptown Westerville – lots of fun going on at the shops in Uptown including a scavenger hunt, making an ornament, writing letters to Santa, cookie decorating and more! 6:30 PM – Mama + Me Make Your Own Winter Hat with Mini Market at Grandview Grind – decorate pre-made hats with bows, ears, poms and more! 6:30 PM – Snow “Ball” at Worthington Community Center – this family dance includes arts and crafts, a photo booth, pictures with Santa, ice carving and more! 7:00 PM – Progressive Christmas Concert at Uptown Westerville Churches – follow guides to 3 Westerville churches to enjoy concerts at each location! 7:00 – Polar Express Weekend at COSI – watch the movie on the big screen this weekend – multiple showing available including some sensory-friendly times! 7:00 PM – Harry Potter Magical Holiday Ball at Barnes and Noble – inspired by the Yule Ball, this event will be filled with crafts, wizarding games, music and more! 7:30 PM – A Fairy Tale Christmas Carol at Worthington Community Center – the famous story of A Christmas Carol is getting redone with your favorite Fairy Tale characters! 7:30 PM – ProMusica’s Messiah Sing Along at Southern Theatre – sing along with ProMusica musicians! 9:00 AM – Breakfast with Santa at Grove City YMCA – have breakfast, do crafts and take your own picture with Santa! 10:00 AM – Jack Hanna’s Home for the Holidays at the Columbus Zoo and Aquarium – bring an enrichment toy for the animals and you can get in free to Wildlights this night only! 10:00 AM – Clay Pot Elf Craft at Michaels Stores – kids 3 and up can drop in to make a holiday craft for $2! 11:00 AM – Family Fun Day continues in Uptown Westerville – lots of fun going on at the shops in Uptown including a scavenger hunt, making an ornament, writing letters to Santa, cookie decorating and more! 11:00 AM – Holiday Open House in downtown Delaware – local businesses are offering specials and special events and there will be a visit from Santa! 11:00 AM – Top Hat Treat Holder Craft at Lakeshore Learning – make a treat holder at this drop in event! 12:00 PM – Short North Pole Shop Night in the Short North Arts District – many business are staying open late to offer extra hours to shop, special deals and fun activities! 12:00 PM – Santa Claus at Rocket Fizz – Santa will be on hand for pictures and to hand out treats! 12:00 PM – Letters to Santa at Ohio Railway Museum – at this event you can write a letter to Santa, make Christmas crafts, ride on a train, and visit with Mrs. Claus! 1:00 PM – Christmas Open House at the Hanby House – tour this 1850’s home to listen to live music, partake in refreshments and enjoy holiday decorations! 1:00 PM – Holiday Trolley Hop in the Discovery District – hop on a trolley to visit downtown sites like the State Auto Nativity, Main Library, Topiary Park, Thurber House, local churches and more! There will be fun activities for the entire family! 2:00 PM & 7:30 PM – A Fairy Tale Christmas Carol at Worthington Community Center – the famous story of A Christmas Carol is getting redone with your favorite Fairy Tale characters! 7:00 PM – Family Night with Columbus Blue Jackets – this special night features interactive stations, a family photo station, balloon artist, face painters and more! 8:00 AM – Paws with Claus at Polaris Fashion Place – get your pet’s picture with Santa before the mall opens! 11;30 AM – PJ Library Hanukkah Rock and Hop – a family-friendly concert by musician Sheldon Low! 1:00 PM – Christmas Open House continues at the Hanby House – tour this 1850’s home to listen to live music, partake in refreshments and enjoy holiday decorations! 2:00 PM – A Fairy Tale Christmas Carol at Worthington Community Center – the famous story of A Christmas Carol is getting redone with your favorite Fairy Tale characters! 2:00 PM – Family Holiday Show at Big Bang Columbus – kids crafts, dueling pianos, a sing-a-long and a visit from Santa are at this event benefitting Nationwide Children’s Hospital! 4:00 PM – Golden Spike Open House Christmas Celebration at The Depot – watch a holiday movie, eat refreshments, do crafts, ride the Scioto Valley Railway and more! 5:00 PM – Westerville Symphony: Sounds of the Season at Fritche Theatre at Cowan Hall – lots of holiday favorites including sing-a-longs at this festive concert! http://whatshouldwedotodaycolumbus.com/wp-content/uploads/2016/12/columbus-weekend-december-2.png 788 940 Julie Miller http://whatshouldwedotodaycolumbus.com/wp-content/uploads/2018/01/What-Should-we-do-today-columbus-NEW-blue_03.png Julie Miller2016-12-07 16:20:562016-12-08 08:13:20What Should We Do This Weekend? 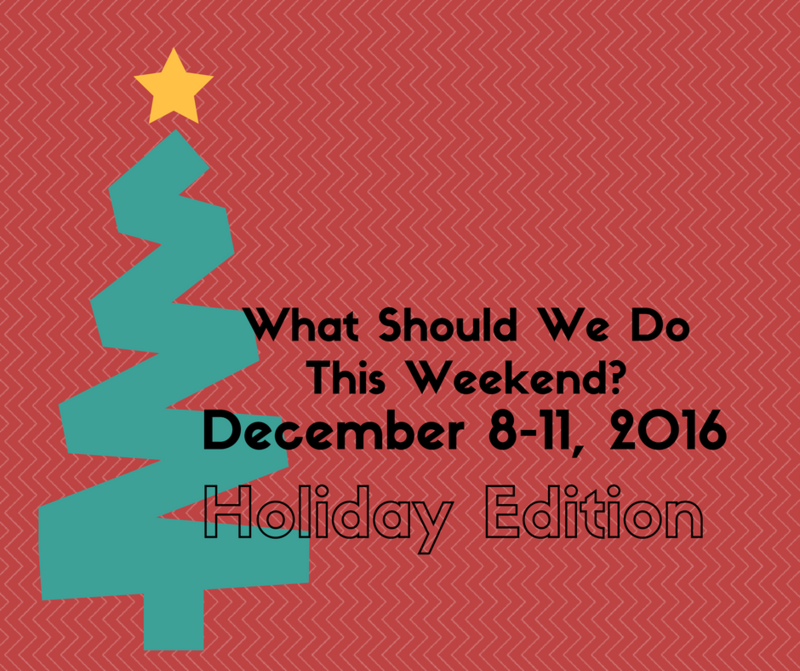 December 8-11, 2016 Holiday Edition! What Should We Do This Weekend? December 1-4, 2016 Holiday Edition! For more ongoing ideas like the Huntington Holiday Train, Think Outside the Brick Lego Exhibit, Merry and Bright and more, click here for 10 of Our Favorite Columbus Christmas Traditions! 5:00 PM – Hilliard Holiday Hop – carolers, hot chocolate, trolley rides, Santa, cookie decorating and the official Tree Lighting! 5:30 PM – Holiday Festival and Tree Lighting at The Ohio Statehouse – this indoor ceremony features a short program, welcomes Santa and Mrs. Claus and continues with snacks, crafts, games and live performances! Pictures with Santa are free! 6:00 PM – Illuminating Shopping in Old Worthington – luminaries will line the streets and retailers will stay open late for special shopping hours. Horse drawn carriage rides will take you around the neighborhood! 2:00 PM – Sip & Shop at piccadilly – enjoy personal shoppers, free hot cocoa and complimentary gift wrapping while searching for the perfect toy! 5:00 PM – First Friday Film Series at Ohio History Connection – watch A Christmas Story and enjoy special First Friday activities before the movie which starts at 7:00. 5:00 PM – Grand Illumination at the Scioto Mile – lots of live entertainment including BalletMet, Comedy Jugglers, OSU Urban Art Space, Santa and the official lighting of the Scioto Mile. You can also support the Empty Bowls Project and Mid-Ohio Food Bank by purchasing a hand made bowl filled with soup! 6:00 PM – Winter Festival in Upper Arlington – the city’s tree lighting ceremony also includes horse-drawn carriage rides, ice carving, carols and a visit from Santa! 6:30 PM – Mama & Me Handprint Ornament Class hosted by Mini Market – make a keepsake clay ornament of your child’s hand! 9:00 AM – Lionel Train Day at Moody Street Trains – enjoy door prizes, face painting, a visit from Santa and operating train displays! 9:00 AM – Christmas Prelude at The Grand of Dublin – enjoy breakfast with Santa, a coloring contest, gingerbread house decorating, and ornament contest, craft fair, bake sale, hot chocolate bar, musical performances and more! CANCELLED due to illness . . . 10:00 AM – Make a Christmas Ornament at Lowe’s Build and Grow – register online to receive an apron, goggles and a patch along with your ornament project! 10:00 AM – Cheryl’s Annual Holiday Party in Westerville – free pictures with Santa from 10:00 AM – 12:00 PM, frost a cookie with Mrs. Claus, free samples, special prices and a Secret Santa Shop! 10:00 AM – Christmas Celebration in Grove City Town Center – a full day celebration includes visits with santa, live entertainment, a parade, the Mistletoe Market and much more! 11:00 AM – Holiday Gift Making at Franklin Park Conservatory – children can make and take their own gifts! $2 per gift! 11:00 AM – Made Local Marketplace at Brookshire – Ohio made products by local vendors for your shopping enjoyment! 12:00 PM – Bexley Holiday Hop in Bexley – Bexley merchants will offer special promotions, entertainment and samples! There will be princesses and Mr. and Mrs. Claus! Fill your snowman card to enter the drawing for prizes! 12:00 PM – Holiday Hop in the Short North Arts District – the biggest Gallery Hop of the year includes a visit with Santa, decorated windows, and lots of holiday cheer! 12:00 PM – Christmastime Open House at the Central Ohio Model Railroad Club – visit the club during these special open house days (Saturdays and Sundays throughout December) to view large model railroads and try out the interactive Thomas the Tank Engine lay out! 12:30 PM – Secret Gift Shoppe at Cruz Candy and Studio J – Spin the wheel for free candy at Cruz Candy, taste free chocolate and kids can create surprise gifts for family members at Studio J upstairs! 2:00 PM – Holidays in Powell – event includes a visit with Santa and Mrs. Claus, activities in downtown Powell, and the lighting of the city’s Christmas tree in Village Green Park! 6:00 PM – A Holiday Evening on the Farm at Gallant Farm Preserve – live Christmas music, roast chestnuts, eat cookies and make holiday decorations at this celebration of the holidays set in the 1930’s! 11:00 AM – Made Local Vintage Marketplace at Brookshire – Ohio made market that features 60 local vintage vendors and makers! 12:00 PM – HolidayVille in Clintonville – take the Jolly Trolley throughout Clintonville to visit with santa, decorate cookies, make crafts and much more! 5:00 PM – Village Lights in German Village – stroll the streets of German Village to visit business who will stay open late to offer holiday specials and free treats. There will be live music and lots of holiday festivities throughout German Village! ICYMI: November in Review: Amy’s Donuts, Louisville, Toddler Theater and More!  http://whatshouldwedotodaycolumbus.com/wp-content/uploads/2016/11/holiday-weekend-columbus.png 788 940 Julie Miller http://whatshouldwedotodaycolumbus.com/wp-content/uploads/2018/01/What-Should-we-do-today-columbus-NEW-blue_03.png Julie Miller2016-11-30 20:52:032016-12-03 09:19:05What Should We Do This Weekend? 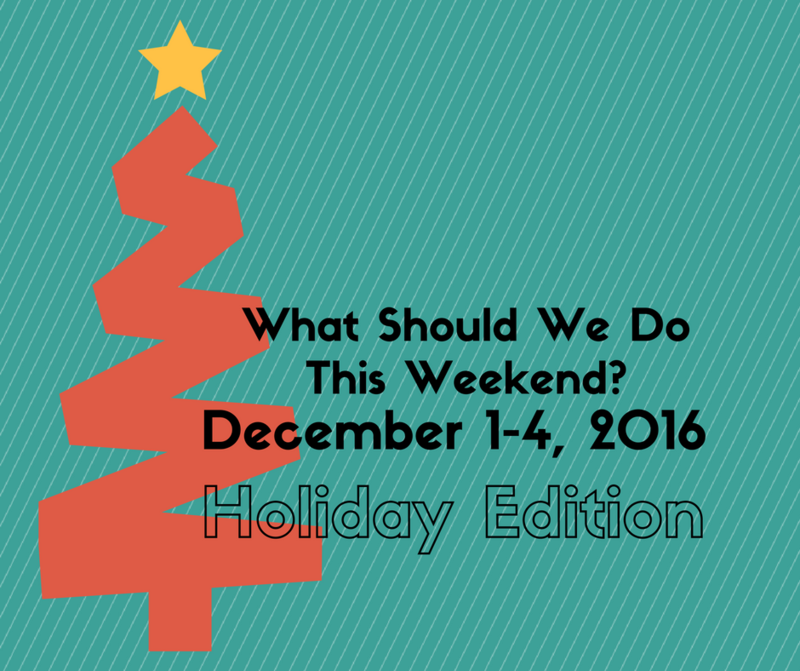 December 1-4, 2016 Holiday Edition!